Bone consists of various types of tissue with different consistencies. Long, tubular bones have an outside consisting of a strong, dense structure of tissue fibres known as cortical or compact bone. Inside the bone case is sponge-like trabecular bone with fine trabeculae, this is the area that is mainly affected by osteoporosis. The fine bone structure (microarchitecture) inside the bone casing is particularly at risk from osteoporosis. The image on the left shows a healthy bone and normal dense bone structure. The image on right shows a bone with osteoporosis which has much more empty space; this is caused by the trabeculae bone being weakened and destroyed. The loss of trabeculae reduces bone strength, restricts the supply of minerals to the entire bone tissue and increases the risk of fracture. Day-to-day movements like walking, running and lifting objects, stimulate the body’s production cells (osteoblasts) to grow naturally to maintain and increase bone density. Low intensity vibration treatment with Marodyne LiV stimulates the production cells in the same natural way with just 10 minutes’ treatment a day. A young person continuously develops bone mass until they are about 30 years of age. Between the ages of 30 and 40, the skeleton has its maximum bone mass and highest bone density. After the age of about 40, our bones start to deteriorate very slowly – a normal and natural process. 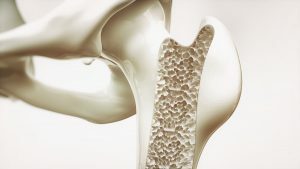 This degeneration usually only becomes significant and problematic from about the age of 60, when bones start to break. However bone degeneration can occur at much younger ages due to a variety of reasons such – lack of physical exercise, cancer treatment, anorexia, cerebral palsy or an early menopause . It is possible to change and improve the structure of bone by using low intensity vibration treatment.